We spent yesterday making a lot of decisions which meant a lot of running about, getting tile samples, going home to see them in the light of the master bathroom, and then taking them back. I did buy the chandelier for the vanity and husband completed the wiring of it today. After looking at some of my possible choices of tile, some were discarded because they were too busy, too plain, or the colors didn’t match up well. I decided on this tumbled stone mosiac tile from Lowes. The lightest cream matches the marble countertop almost exactly. It has a bit more gray in the pattern then we would like so we will remove some of the darker gray and put in some of the lighter creams when we actually install it. This means buying some extra sheets and just doing some cut and paste work. 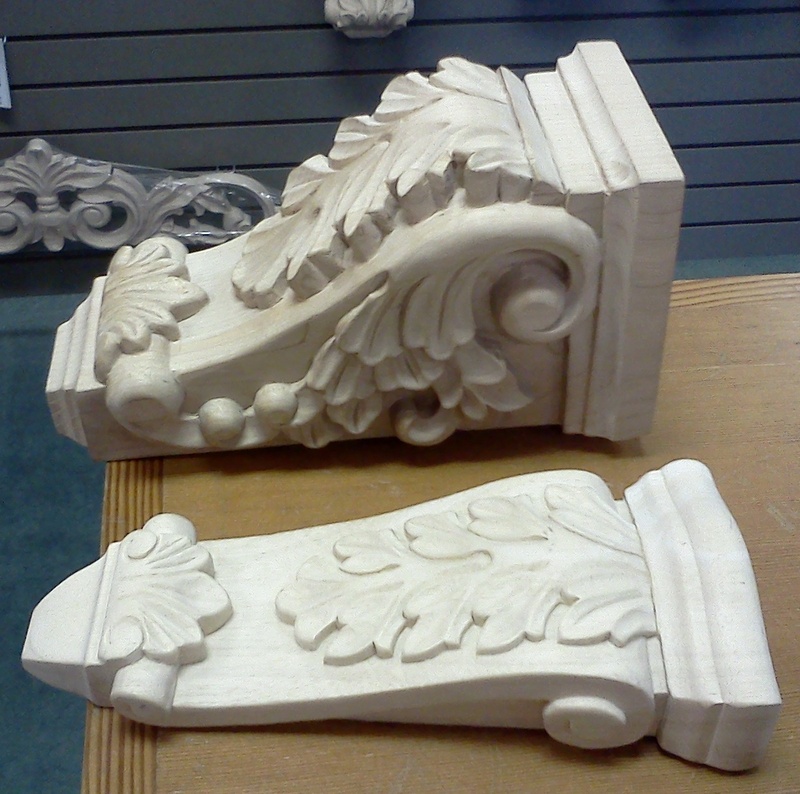 We also visited a store that sells corbels as I wanted to decide on this with hubby present and this store is open with limited hours. The trick to making arches complement each other is to make the longest drop the same ratio as the arches peak (as measured from the top to bottom). 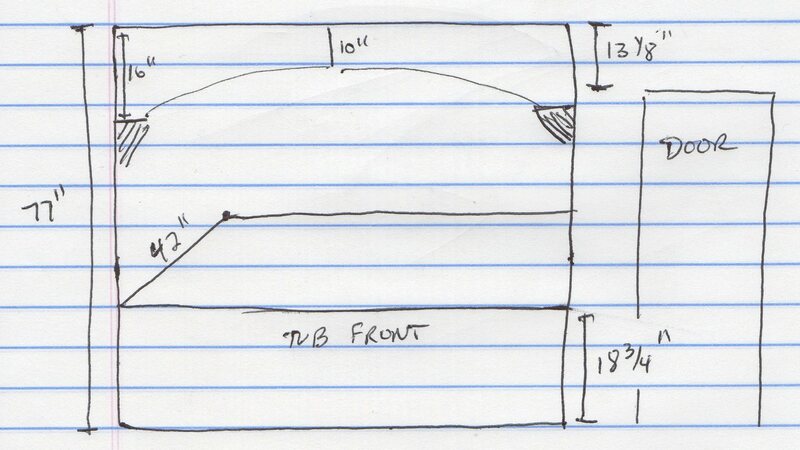 The vanity is 24:18 and the tub is 16:10 – each has a 6″ difference. Instead of replacing the heater fan unit (another $150 and another hole to work around) we decided to spraypaint the cover white and just keep the old as it is perfectly functionable. 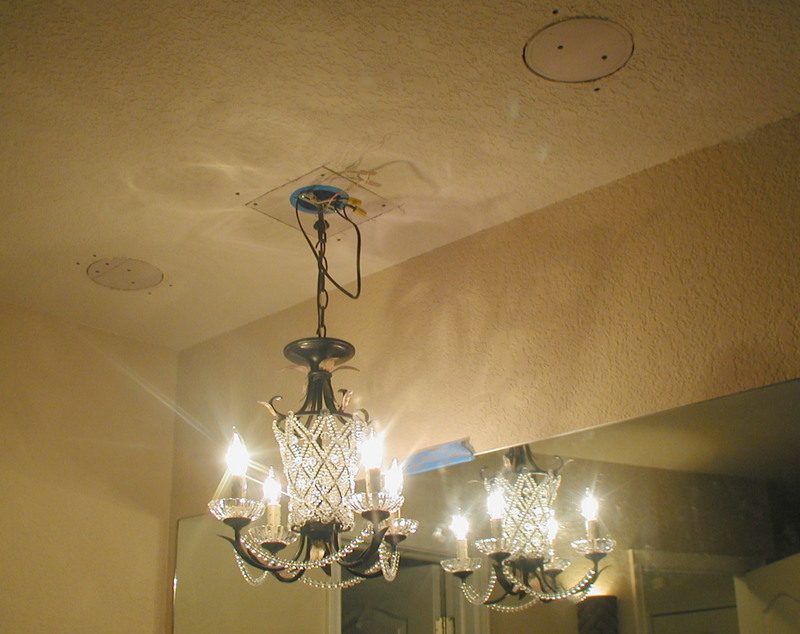 The two can lights over the vanity were removed, their holes covered in drywall and a new chandelier installed. The ceiling will be plastered tonight, sanded and then plastered again tomorrow, to prepare it for the ceiling color (Lowes Pale Glow Brilliant Metal) which really needs a flat wall surface. Next weekend the ceiling should be done, the walls painted, the trim worked out… the arches may delay us as the corbels have to be ordered and this store is slow about getting this stuff.